Over the opening credits of director Clint Eastwood’s Jersey Boys, there’s something unusual for a modern movie: an overture. And over the closing credits, there’s something unusual again: the entire cast joining together, dancing in what amounts to a curtain call. If you watched only the first minute and last minute of Eastwood’s Jersey Boys, you might think that this guy has a pretty solid handle on the risky proposition of turning a Broadway musical into a movie. In recent years, as audiences have generally resisted movie musicals that aren’t animated, we’ve seen how hard it is to translate to the screen what makes a musical work on stage. And Eastwood—a director who generally displays a minimalist visual sensibility—might seem like exactly the wrong guy for the grand theatricality of a story that began as singing and dancing in front of a live audience. The frustrating thing is that he seems to want to give the audience for his Jersey Boys the experience of watching a stage musical in a movie theater, without really grasping what to keep and what to change. 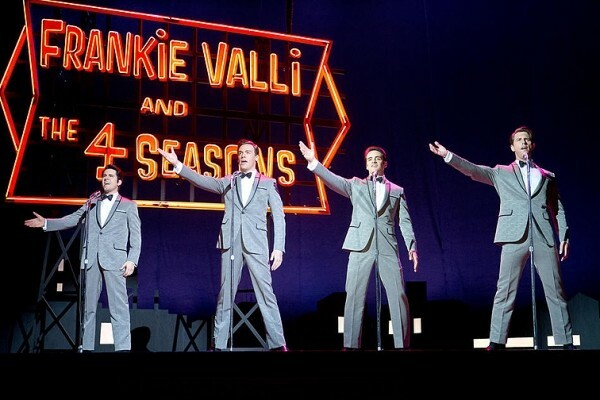 Jersey Boys tells the story of the Four Seasons, the legendary pop music group that begins with Newark, N.J., childhood friends Frankie Castelluccio (John Lloyd Young) and Tommy DeVito (Vincent Piazza) performing club gigs together with bassist Nick Massi (Michael Lomenda) whenever they’re not involved in small-time crimes. As they get more serious about their music—including Frankie changing his last name to Valli—they hook up with songwriter Bob Gaudio (Erich Bergen) and start recording hits that take them to the top of the charts, while the inevitable tensions work at the group from within. And along the way, we get great little bits of trivia, like the role eventual Oscar-winning actor Joe Pesci plays in the group’s formation. The stage version of Jersey Boys—with a book by Marshall Brickman and Rick Elice, who also adapted the screenplay—employed a device in which each member of the group narrated their version of the story in turn. That notion is retained here, but only halfway: The characters sporadically break the fourth wall and address the audience, but not in any cleanly organized manner. And as a result, the movie loses the key notion that each member of the group recalls their rise and fall in his own way, leaving only a standard musical biopic complete with the kind of “everyone instantly realizes this new sound is amazing” scene that was so brilliantly mocked in Walk Hard. Even the way the music itself is handled becomes a frustration. While plenty of terrific Four Seasons hits appear throughout the film—“Sherry,” “Big Girls Don’t Cry,” “Walk Like a Man,” etc.—the context almost always requires the story to stop dead to present an actual performance by the group. While that might feel more natural than other “jukebox musicals” like Mamma Mia! which have the characters burst into song in the middle of their lives, it changes the energy of the storytelling, and draws attention to stretches of the narrative when music seems to disappear entirely. Most problematic, however, is the nature of the performances, which feel as though they’re being pitched at a live theater audience. The story overflows with broad characterizations—Tommy’s “fuggedaboudit” strutting; the flaming gay mannerisms of the band’s producer, Bob Crewe (Mike Doyle)—that might work on a stage, but start to feel shrill and overwrought when blown up with cinematic intimacy. Young won a Tony Award for originating Valli on Broadway, yet while he has a handle on the sense of loyalty that complicates his relationship with the volatile, fiscally irresponsible Tommy, he still gets stuck in scenes of domestic melodrama with Frankie’s wife, Mary (Renée Marino, who also played her role on stage), that degenerate into awkward shouting matches. There’s an ironic moment in Jersey Boys when Frankie gets advice before a performance on The Ed Sullivan Show, explaining how he should perform for the camera rather than for the balcony. Eastwood never seems to give his own actors that same advice. He clearly loves the idea of filming a live performance of Jersey Boys for a movie-theater audience—but by the time his cast takes a bow, it feels as though it wasn’t such a great idea.